QuestionHow long does it take to cross the US on a horse? Hopes&Fears answers questions with the help of people who know what they're talking about. Today, we're asking equine enthusiasts to calculate how long it takes to traverse the country on horseback. At the end of last year, Uber reported that the car service app took riders on one million trips daily. In 2014, there were 5,597,551 MTA subway riders bustling through New York City on the average weekday. And 5.9% of commuters in Portland rode bikes, as reported by the League of American Bicyclists in 2013. Preferred methods of transportation vary wildly by city and demographic, but there are people who still use horses as their main ride. Equestrian travelers cite different reasons for getting around by horse. Some are on a mission to support important or personal causes like cancer research. Many horseback riders think of the journey as a time to discover themselves. And then there are the real “long riders”—horse lovers and trail masters who make the trek across country, living the Colonial life in the 21st century. Speaking to several equine experts and an American West historian, we discovered just how long it would take to cross the United States by horse. In the international equestrian travel community, this journey is known as riding “ocean to ocean.” Unlike travelling in an automobile, equestrian travel requires much more time. The long rider must factor in extra time needed for delays such as replacing horse shoes, allowing the horse to rest—which generally occurs after traveling every 500 or so miles—bad weather, etc. With the demise of traditional stables, the increase in heavy traffic, and the normal delays associated with this journey, a person should allow at least six months to ride from New York to San Francisco. Under normal conditions, the trip normally takes about four months. 10-12 gallons of water is the amount of daily hydration most adult horses weighing 1,000 lbs require for good health. The short answer is about five months. For example, I left the Atlantic Ocean on January 2 and arrived in San Diego, California on May 16. Normally, if a horse bumps into something or has an accident, he might bounce back quickly. But when you ride a horse continually, it can be a devastating injury once resistance is worn down. The mental attitude of the rider might be the biggest issue at play. Horses tend to hold up better. But when you take people away from their morning latte or favorite TV show, this puts them in a whole new world. The trip is fairly easy if you plan your route. The only way to successfully do it is to try to ride three days and rest one. The following week, rest for two days. That way, you can do your banking or letter-writing, and let your horse have a break. I try to set up camp before 3 PM so I’m not being rude to the public, media, or any horse clubs who have come out to see me. There’s a psychological factor that you have to deal with, too. If you ride with a trailer (driven by someone else), the horse is going to look for it—its home. You want them looking down the road ahead at all times. Always be riding “home” (with the trailer in front of the horse, not behind). Most people who try to do a solo trip across the country end up looking or being treated like a hobo. People don’t seem to welcome them as much. A group adds diversity. Animals are a no-no on the interstate. Even if they were permitted, you don’t want to risk everyone’s safety with the high speed of traffic and the conditions. But you can generally ride a horse where you can ride a car. People think they know everything about themselves and their horses, but they know nothing. At least not until they ride a horse for a few months. You ride in the same footsteps and conditions as the early explorers. The bond that is created between you and your horse is indescribable. Your life will be changed forever. ← As part of his role as a Trail Master, Seay has made the cross-country ride himself, traveling over 3,000 miles, alongside 256 participating riders, with stops at 83 host towns. Andrew Needham, an associate professor of History at New York University who specializes, in part, in the American West, crowdsourced our question to fellow historians (he admitted he doesn’t know much about horse travel). His colleagues, who focus on the 19th century, helped offer some background. It took two weeks to get from New York City to Chicago by land before rail connection, provided there were good conditions (no mud, snow, etc.). 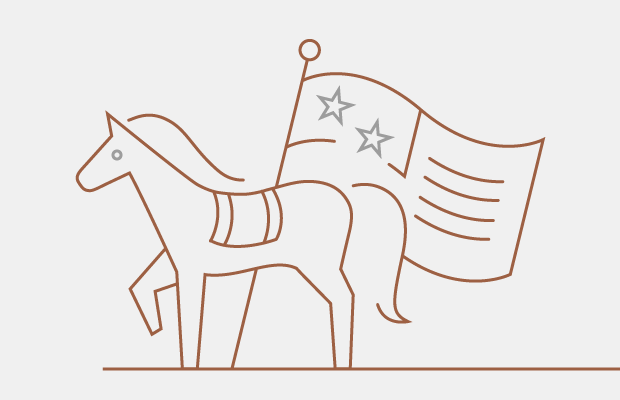 And then there’s the good ole Pony Express, which delivered letters and packages by horseback from St. Joseph, Missouri, across the Great Plains, Rocky Mountains, and Sierra Nevada, to Sacramento, California (with the help of nearly 200 relay stations where riders exchanged horses). Needham and his colleagues advise that Pony Express riders switched horses approximately every 10 miles and took 10 to 13 days to get from Missouri to Sacramento. One ad from 1860 promised a 10-day delivery from coast to coast, but research by the late Martin Ridge, the foremost historian of the Pony Express and former Director of Research at the Huntington Library in California, indicates that this was never quite achieved. Needham and his colleagues explained that a horse needs to be reshod every four weeks under heavy travel. Their calculations are below. ...is 10 MPH for about 5 HOURS a day (stagecoaches traveled 3 to 5 mph). If the United States is roughly 3,000 MILES long and you’re covering about 50 MILES a day, that’s 60 DAYS on the road. and you’re looking at 70 to 80 days to cross the United States by horse. “If you were trying to do it today, with roads rather than trails,” says Needham, “probably less.” Dare to try?